My name is Sruti Sriram. 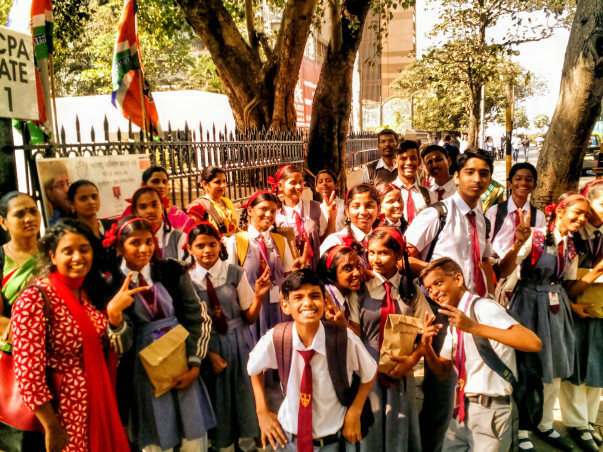 A little over a year ago, I moved to Mumbai after a lifetime in the US to try to make a dent in India's problem of education inequity as a Teach for India Fellow. 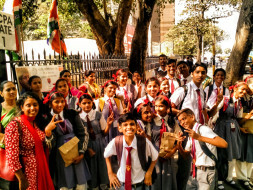 Today, my days center around 86 ninth-graders at Shivner Vidya Mandir, a low-income school in Saki Naka, Mumbai. My students are bundles of energy. They are inspiring, heartbreaking, wickedly intelligent, surprisingly mischievous, and always eager to learn. I believe that they deserve the best possible education, but often resources come in the way. Our classroom vision is, "We will take ownership of ourselves and our peers in order to achieve excellence," and every day, I see proof points of that excellence and leadership in my students. I see it when Preeti fights against family pressure to stay in school and pass tenth boards, even when they tell her that she doesn't study well enough for it to be worth it. I see it when Sarvesh stays after school and makes revision worksheets for every student in class. I see it when Kajal and Pratibha got permission from the principal to run seminars about gender equality in every classroom in school, so that all students will be equipped to solve India's toughest problems. The excellence these students strive for requires resources so that they can achieve their goals and be whoever they want to be, despite the circumstances they come from. Preeti and Nadeem need help paying school fees so that they can stay in school, Sarvesh needs to photocopy his handmade worksheets, and all of my students need access to award-winning and challenging books so that they can improve their reading, critical thinking, and exposure to the world. We want your help so that we can make these projects, and many more, come to fruition, so that our students can be proof that anything is possible. **The money from this fundraiser will be used primarily to buy a projector and speakers for the classroom, and worksheets, books, dictionaries, and other school supplies for children. For students with exceptional mitigating circumstances, it will also be used to help defray their cost of attendance at Shivner, including school fees (Rs. 500 per month), uniforms, and textbooks. The students have recently given their board exams and are waiting on the results. The current withdrawal is for the reimbursement of the fellows who have been teaching the students the last year and have paid for expenses like textbooks, trip to an amusements park, organizing of a fest by the students of our class on their own etc. from their pockets. It also includes some miscellaneous expenses like taking students out for college visits, buying textbooks for some students and others. We are close to our Mid-term exams and are taking the kids on an excursion to a theme park. The last few weeks (months) have been full of pressure and we hope this will help blow off some steam before we get into the preparations for their board exams. We are withdrawing these funds for Learning Disability certification for some of our kids who need to appear for their grade 10 board examinations soon. Also using a part of these funds for daily classroom expenses. Janaki Perincherry (Janu) is my very dear sister. Got the reference from and her and am making a very small contribution towards this wonderful cause. Sruti, As requested by you, Iam donating Rs.5000/-. All the best for your future. From Mani Mama.